These Tuesdays sure roll around quickly..
etched glasses trimmed with gold from Pfaltzgraf, the others are antique from a friend, they were her mom's.. Cream and wine toile napkins from WSonoma outlet, as well as the indiv butter dishes. and the tassels on the napkins are from WSonoma, meant to be used on wine bottles. 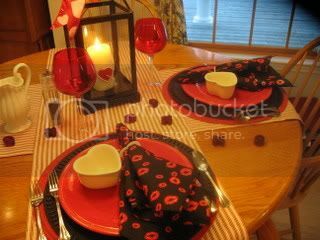 Susan's blog, Between Naps on the Front Porch has a list of other blogs participating in Tablescape Tuesday, be sure to give them a look when you have time! And thanks for your visit here, I appreciate it!!! Pretty tables...and I LOVE the napkins in the first table! 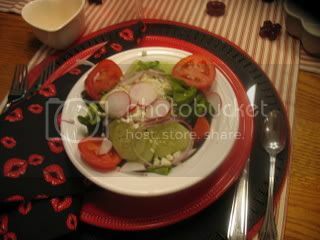 and now I am hungry...do away with the sidebar... I am trying to lose weight!!! 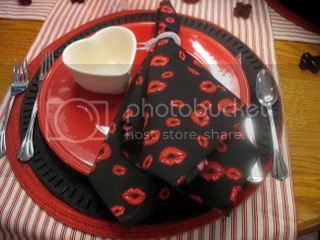 Both your tablescapes are lovely, but I love the red and black. Those little heart bowls are precious! 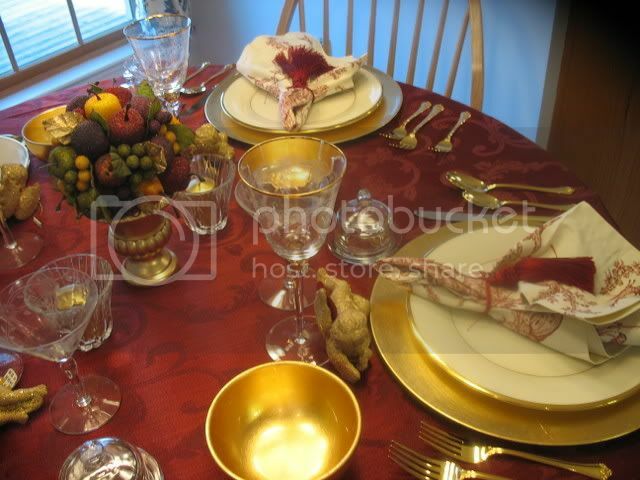 Kathleen, I love that you're participating in Tablescape Tuesdays... We all get a chance to see your VAST selection of dishes, napkins, tablecloths, napkin rings, accessories, etc, etc. The first is so elegant, but I LOVE the casual setting. I love both tables. I like how you used the tassles for napkin rings and I love those napkins. OK I already had dinner and my mouth is watering when I look at your header!!! Love toile napkins,everything is just lovely! I love the heart dish in the second one. Two wonderful tablescapes! Yummy! Both tables are wonderful! I see romance in your future! I love the angels and the kisses napkins! They are adorable! The little heart shaped bowl is cute too. I love both tables. I love the napkins in the first pictures. I love the red, white & black in the second. Great job on both!! I like both tablescapes. Each appealing in their own way. I love the tassels on the napkins. Great look on both tables. One so elegant with rich colors and touches of gold. I just love the toile napkins..The other, looking so festive and 'flirty' with those darling napkins. These tables are so pretty! I love the red with black. Thanks so much for the inspiration. 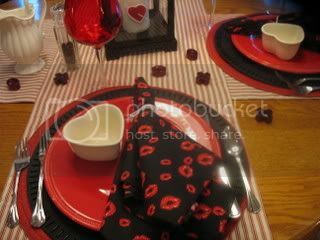 I especially loved the Valentine table and the napkins were so cute. Kathleen, you have the BEST table settings! I always look forward to your posts. They are both perfectly LOVE-ly! 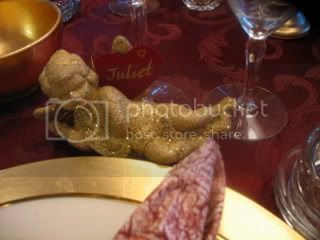 I especially love the Romeo & Juliet tablescape...very elegant and romantic! Wow, two tables, impressive and I LOVE them both! My colors. Want those toile napkins! Oh my gosh! I should have came here first, over at wfd I knew those cherubs were destined for greatness and here they are posted already! I love the simple elegance with the toile napkins and golden accents of the first setting but I also like the simple whimsy of all the heart accents of the second setting. Those heart ramekins are too cute! I've started looking forward to Tuesdays to be able to come and visit your wonderful tablesettings. Kathleen - love all your pieces and linens..you put everything together so well!! Wow - just beautiful, Kathleen. I love the new 'look' at your place and those two tablesettings are just wonderful - although the formal one is drop-dead gorgeous! double your pleasure, double your fun! i adore your first napkins, the table is very elegant, great show! i remember hot lips from last year! cute with the runner, and gosh, is that plastic food, or are you cooking up a storm too! 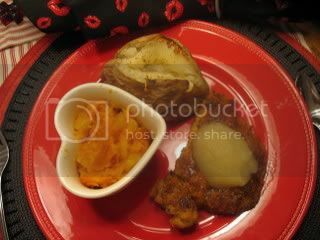 very well done kathleen, thanks for sharing. I kept a grandson yesterday so I am just now getting around to some of the TT tables....sorry! 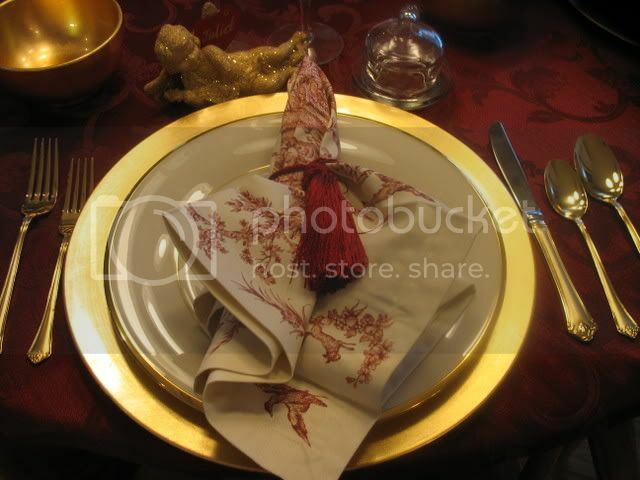 Love teh red toile napkins & the cherub "napkin rings" in the first picture! Oh my! What stunning tables. Love the napkins on the first one and the little cherub. Your table settings are so beautiful, Kathleen. I love the red and black. 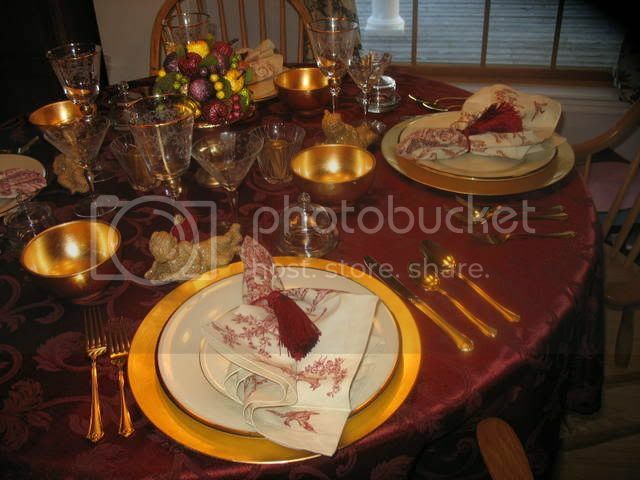 Great tables, Kathleen, I look forward to seeing your tablescapes! These two are tops! Love the elegance of the first! Kathleen, you need to publish a book on Tablescapes! Seriously, you have the touch. Love the black and red, and they are both just super.